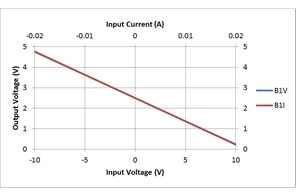 This design inputs ±10V or ±20mA and outputs 2.5V±2.3V. 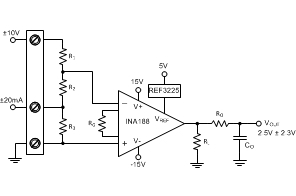 It utilizes the INA188, which is a zero-drift instrumentation amplifier. The 2.5V reference voltage is provided by the REF3225. Measured performance yielded just 0.153% error (typical).